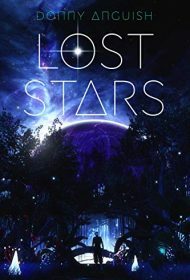 In Lost Stars, Donny Anguish crafts an ambitious and engrossing science fiction novel that extends across centuries and multiple worlds. Anguish imagines a future where human beings have colonized 38 worlds through the creation of Essens, bio-mechanical devices that harness the energy of distant stars, allowing for inter-planetary travel. Due to a virus, in rare cases Essens turn humans into “dynamics” who can directly yoke a star’s energy. Humans have also achieved the ability to live forever or significantly prolong their lives using a “one-time gene therapy.” This procedure is expensive, segregating those that have taken advantage of it and those that cannot. The novel’s protagonists, Jon and Saiph, meet on an isolated moon, Jangali, where humans live primitive lives. Born on Earth, Jon co-designed the Essens; he’s also immortal. Raised on Jangali, Saiph is the “first Class G human dynamic [the most powerful] out of thirty-seven billion souls in existence.” He draws energy from blue stars, the most energetic type. Their lives become enmeshed as they work together to resolve a violent conflict against a common enemy. Lost Stars has a compelling narrative structure. Anguish interweaves the fast-paced action on Jangali with a series of Jon’s letters, which encompass 600 years of human development. Thus, the mysteries behind the current conflict on the moon and Jon’s origins are disclosed in tandem. This adds to the conclusion’s gripping nature, which simultaneously reveals the complexity of the protagonists’ relationship and their shared purpose. The technical and biological advances Anguish imagines are credible and thought-provoking, and the author crafts persuasive characters, such as Saiph and his captivating spiritual dimension. Saiph relies on the Tenants [sic] and Verses Jangalis live by, which provide guidance and explain the tribes’ origins. In all, Anguish has created an excellent foundation for a series located in the universe of Lost Stars. Science fiction fans will find this a highly rewarding and absorbing read. BlueInk Heads-Up: While the misspelling of “Tenets” (as “Tenants”) is an unfortunate and problematic mistake, it does not signify a larger copyediting problem.